Nancy Blackett, Arthur Ransome's favourite amongst his various cruising yachts was named after his favourite character, the adventurous and irrepressible leader of the Amazon Pirates in his "Swallows and Amazons" books. Nancy Blackett provided Arthur Ransome with the inspiration for possibly his best book "We Didn't Mean to Go to Sea", a classic of both children's and seafaring literature, in which she plays a leading role as the Goblin. Nancy Blackett was built in 1931, a Hillyard 7-tonner, 28 feet long, excluding her bowsprit, with an unusual Bermudan cutter rig. In 1988, she was discovered near-derelict in Scarborough harbour, and brought back to the River Orwell to be restored. In 1997 she was bought by The Nancy Blackett Trust who are committed to maintaining her as a living vessel and to keeping her original appearance as far as possible. Each year many Ransome fans enjoy the experience of sailing her, and many more visit her at maritime events. The Trust also works with local schools and hosts a number of educational groups each year. 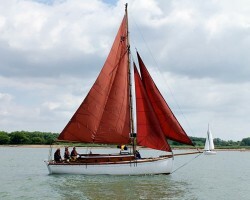 Nancy Blackett is based at Woolverstone on the River Orwell in Suffolk. By joining the Nancy Blackett Trust you can have the chance to sail Nancy Blackett herself and you will also be helping to preserve a beautiful and important part of our literary and maritime heritage. Extra benefits include receiving regular newsletters and the opportunity to attend our social events. Annual Membership - £25 p.a.